Creating a simple, intuitive flow, by creating high fidelity wireframes in a very short time, so that they could be presented to high management for review and project green-lighting. AVG’s first attempt in creating a lock-screen app, sometime around June 2013, has started as a side project, where everybody on the team also operated as its UX designer (we were a PM, a QA tester, a developer and myself, as the UI designer). We created mockups and a POC, and conducted guerrilla user researches both in-house and on the streets around the office. Researches have shown that while users liked the provided features, they found it hard to understand the gestures needed to operate them. The app has been too far along the development process to extensively change its gestures, so explanations and hints were added instead. Even then the experience was still too hard to comprehend and the app proved to be a failure. 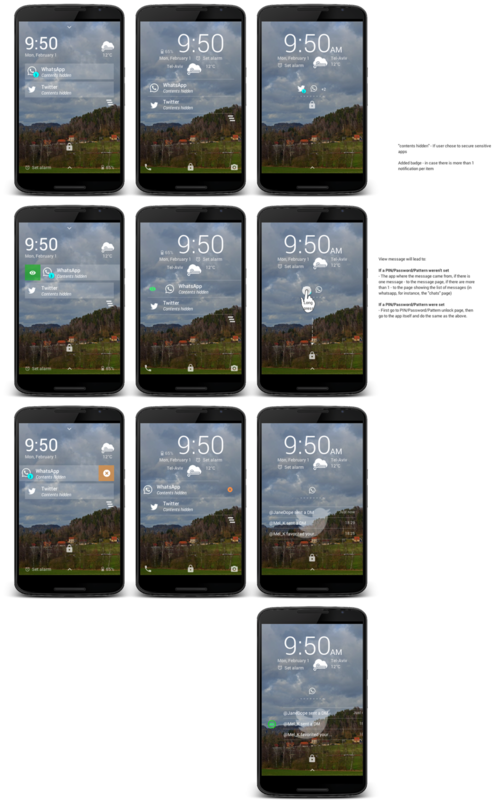 Given former experience, the new (March 2016) AVG LockScreen app’s operation was further simplified, and its purpose has modified from serving as a home-screen with shortcuts to your most commonly used apps, latest phone calls and so on, to become an app dedicated to protecting your data from intruders, by securing your phone with a PIN code/pattern lock. The app shows newly received messages (WhatsApp, Twitter, text messages, emails, etc.) on the main screen - either in full display or encrypted, that can also be accessed immediately right after entering the set PIN/pattern. It also features a weekly weather forecast, camera shortcut, a news feed, and a toolbox drawer - all can be accessed without unlocking the screen. Due to AVG's acquisition by Avast, and although having a lot of user engagement, monetisation and cross-promotion potential, the project was not green-lighted, was never user tested and never became live. The importance of actually LISTENING to the users, and acting upon user testing results.